Be the first to share your favorite memory, photo or story of Judy . This memorial page is dedicated for family, friends and future generations to celebrate the life of their loved one. Judy Stark, 59, of East Moline, died at home after a long illness, surrounded by her loving husband of 31 years, Rick, and other family on Aug. 9, 2018. She was born Oct. 13, 1958, to James S. Olsen and Marilyn J. (Ristau)) Olsen in Moline. She attended St. Mary’s Catholic School and United Township High School, graduating in 1976. She married Rick Stark on Feb. 13, 1988. Judy received her B.A. in Accounting from York College as a non-traditional student in York, Pa., and achieved a CPA license. 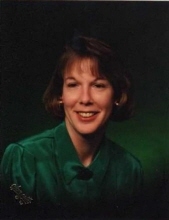 Judy’s career was focused in the world of accounting and bookkeeping, including as CFO at the former Marycrest College. Judy was an accomplished quilter, gifting cherished quilts to family and friends, along with highly anticipated Christmas decorations. She was an avid gardener and reader, and loved antiquing and music. Judy is survived by husband, Rick; mother, Marilyn Benson; siblings, Stan Olsen, Linda Cain (Darryl), and twin sister, Jane Olsen; stepdaughter, Kara Rupp (David); Denise and Wade Argo; Steve and Marcia Stark; Jerry (Jade) McLaughlin; several nieces and nephews; stepgrandchildren, Logun and Trent; and beloved dog, Bella. She was predeceased by father, James Olsen; brother, Timothy Olsen; and mother-in-law, Ilene Stark. No services will be held per Judy’s wishes. To plant a tree in memory of Judy Stark, please visit our Tribute Store. "Email Address" would like to share the life celebration of Judy Stark. Click on the "link" to go to share a favorite memory or leave a condolence message for the family.